When you go to a baseball game, a few things probably stand out. The hotdogs, the music, the white socks, and the classic diamond. Have you ever stopped to think about the fence that borders the diamond? This outfield fence, or wall if inside a stadium, represents a boundary between the audience and field. It keeps visitors safe from entering a potentially dangerous area, and when a ball flies over the fence, it usually signifies a home run. Baseball outfield fences are a vital part of any baseball, softball, or little league field. The largest baseball fence is located at Minute Maid Park in Houston, Texas. A whopping 436 feet at its deepest point, the outfield wall is 10 feet high. In major league fields, outfield fences must be at least 3 feet high. The fences we offer at BaseballFenceStore.com are 4 feet high. We don't sell fences shorter than this to ensure your players feel that they are in the big leagues! The recommended footage of outfield fence for an outdoor baseball field is 500 feet. This gives a home run distance of 300 feet. For softball and little league fields, a 200-foot home run distance is recommended, with 314 feet of outfield fence. The most common types of outfield fencing are chain link fence, a permanent fencing solution, and portable fence, a convenient solution for those who wish store their outfield fence in colder months. An important component of chain link baseball outfield fence is fence topper. Called fence topper, fence cap, and fence crown, fence topper acts as a barrier between people and the sharp edges of chain link fence. It can also be aesthetically appealing - the classic bright yellow color is a welcoming sight at any ball field. Fence topper comes in all sizes, colors, and is available in a variety of materials. 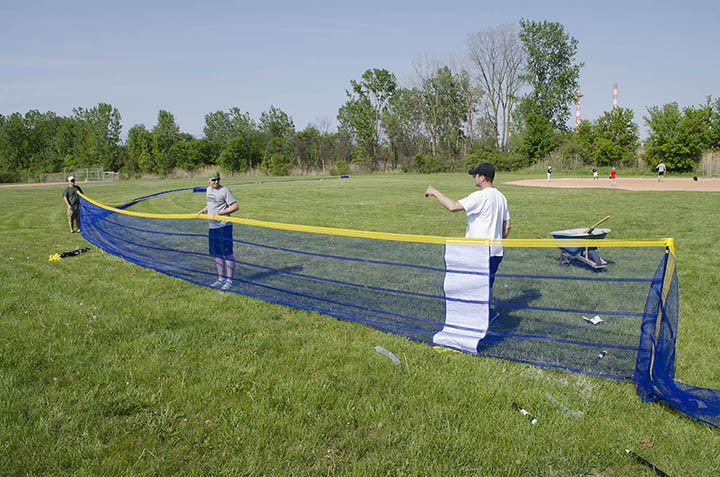 Volunteers install 4-foot high Grand Slam Fencing at Lions Park in Trenton, Michigan.